Hellooo Out There! Today I'm playing along with the Simon Says Anything Goes Challenge of using more than one die cut/punch challenge. This is a top folding A2 card and to create it I began by cutting a smaller panel with a stitched rectangle die and then taking that panel and cutting a smaller oval stitched panel. I cut some foam at the same time in order to pop it up a bit from the background. 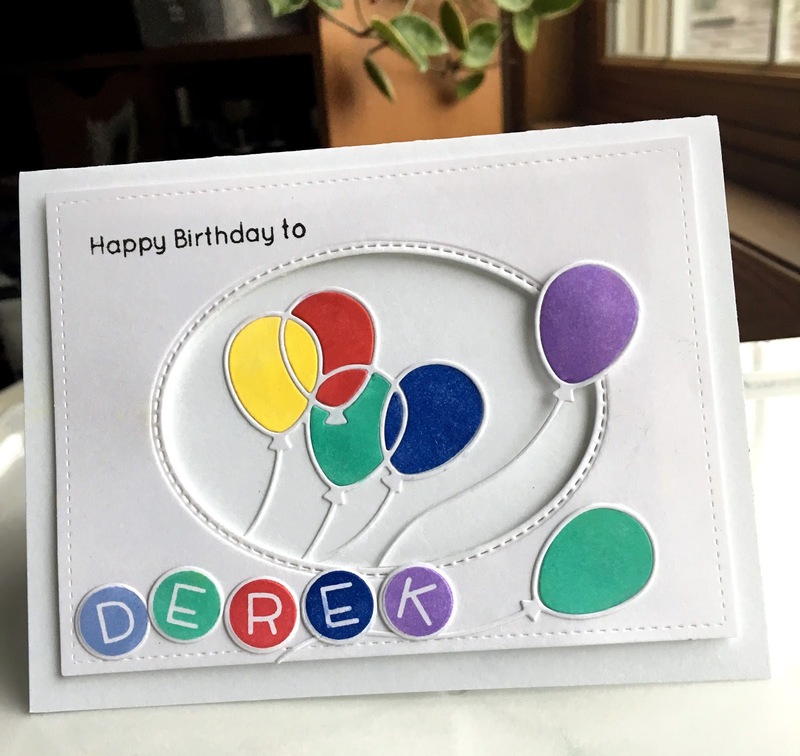 Next I chose some bright colors for this child's birthday card in a pigment ink and cut the balloons from a Simon Says balloon die...I cut the balloons in white and then again in all of the colors because I wasn't sure how I was going to put them together. Once they were cut, I did an inline piecing in the center and then picked two others (as long as I had some extra) to make some stray balloons. I stamped and die cut the letters to form the name, and adhered them with glue dots. Lastly, I stamped the birthday sentiment at the top and Voila! This was a bit time consuming, but I loved the look and will undoubtedly do it again! Thank you for your kind words, Pat! Gorgeous card - love the layout of your design.